FragranceNet was created to provide customers with the best inventory of genuine brand name fragrances, candles, skincare, make up, aromatherapy and gift sets in the lowest price possible. There is no knock off imitations. They don't manufacture any product they carry. FragranceNet sent us their wonderful scented perfume spray called, "WonderStruck Taylor Swift 3.4 oz." I simply love the scent. It's sweet, inviting and a long-lasting perfume spray. Any woman would love to add it to their collection. Just keep WonderStruck Taylor Swift perfume stand out of the rest of your collection. When you buy one for yourself. You'll be using it more than any other perfume you own. 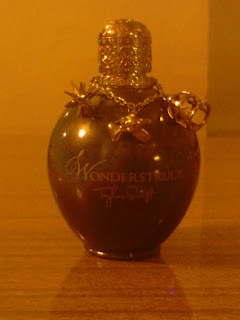 WonderStruck Taylor Swift is the perfume, I rave about! I'll be using it everyday, when I go out. I like having a nice scent and comes in a cute fancy bottle. It's even nice having people ask me, "What perfume are you wearing." If you want to buy WonderStruck Taylor Swift to try it for yourself visit FragranceNet. WonderStruck Taylor Swift will be available in their online store soon. So keep checking when it's available for purchase. They have other products you can view or buy at FragranceNet. To find out how FragranceNet can help you save in special moments big or small. Connect with FrangranceNet on Facebook and Twitter. FragranceNet is sponsoring the Blogorama Bonanza Back 2 School 2012 Event. The event starts August 20, 2012 at 12:00 AM. Come back at 12:00AM to enter to win a WonderStruck Taylor Swift Eau de Parfum Spray 3.4 oz.